No need to use an external Trusted Provider. Do it all on your own servers. Fully complies with all legal requirements and the user doesn’t need to install anything. The FaceKom Software Bundle is an on-premise solution. We install the software onto the bank’s own systems, so all of your data remains in-house. We will be able to access the system only in case of a possible troubleshooting after integration. The software is based on our self-developed closed-circuit video system, which uses its own media server and processes. We do not use external software. 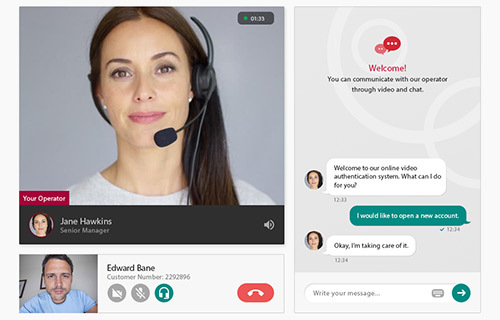 The software offers full call-center functionality; multi-level privilege management, management/distribution of incoming and outgoing calls, replay, opening hours setup, workflow management, etc. The FaceKom Software Package is fully AML, GDPR and eIDAS compliant. FaceKom software distributes incoming calls to the operators for managing each of the calls. The Call Center features provide distributing video calls in a predefined way, recording them and managing feedbacks. Different processes, tasks can be transparent, supervised and managed effectively by different types of users with different rights (administrator, supervisor, operator). Presentation enables operators to present the company’s products and services that they want to sell to the clients. Screen Sharing allows clients to share their screen with the operator. 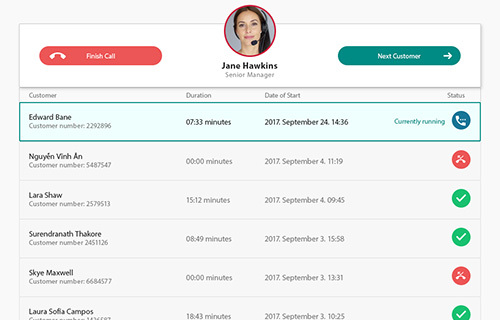 This feature makes us feel like the operator sits next to the clients and help them. We can provide more information about a client's financial history, thus banks can give the best offers in terms of personal loans or new bank accounts. Both parties can share their documents by our file sharing feature before and during the videochat. All of the uploaded documents can be managed by the operator. If it is necessary, the operator has the chance to ask documents to be reuploaded. After identification the client has the possibility to sign documents digitally by using FaceKom Application which makes the whole procedure convenient, fast and more effective. Video calls can be managed by setting up your own workflow. This feature makes it possible to control processes, add comments and give tasks to the operators. Text messages help the operators and the clients to communicate effectively. Text chat is available during the videochat and on the main page as well. After contacting text chat embedded in the website, the built-in chatbot helps to navigate clients and find important information without having to wait for the operator. 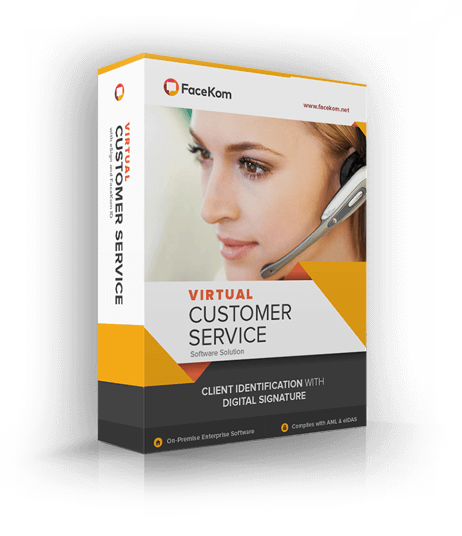 FaceKom software can manage incoming and outgoing video and mobile phone calls as well. After gathering information and personal documents from the clients, an OCR software integrated into FaceKom extracts the necessary information from the clients’ personal documents to compare them with the details provided by the clients in advance. This feature makes it possible to manage opening and closing hours of our virtual customer service. Clients can ask for a callback by giving their contact details. During all virtual administration events, actions, video image, sound and logs are all recorded. Timeflags are used for saved sessions. 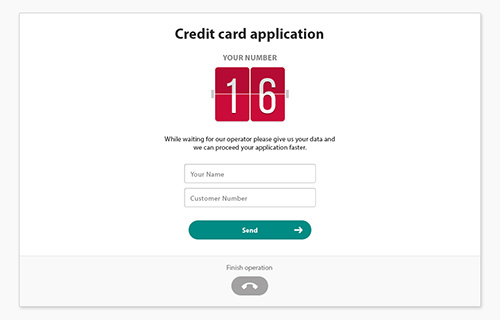 Personal details can be asked from the clients by using the Form filler feature, before entering the surface of the virtual customer service. Documents can be uploaded by the clients and these can be checked by the operators during the videochat. FaceKom software can be connected to existing active directories where you can set-up user and group management and control accesses and rights. So, you need the best KYC service, right now? We’ve got you covered. Walidate, powered by FaceKom can identify a customer in under 5 minutes and uses live, trained operators. IDs are reusable and fully GDPR, AML and KYC compliant. Visit Walidate.com or Watch the Video for more.